Turquoise is not only a stone of happiness, good luck, good health, but also a very stylish item of jewelry. Rings, bracelets, necklaces or earrings made of turquoise is loved by many women, because this stone is extraordinarily beautiful and affordable. Does not hurt to know how to wear turquoise to match. Feel free to combine turquoise with everyday wardrobe. This stone is not considered formal, although some jewelry, including turquoise, it is possible to wear with evening dresses. 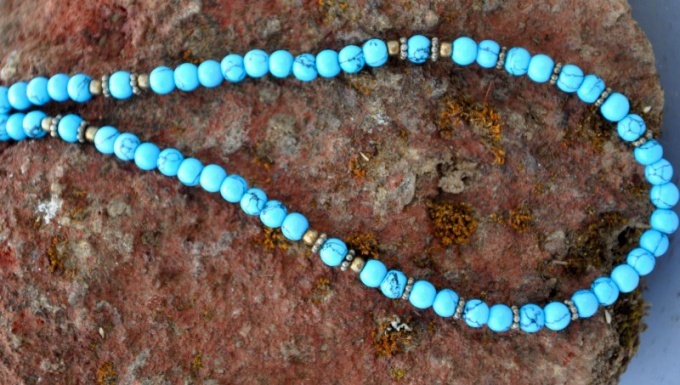 Beads of turquoise to wear with denim, white cotton or linen. Small earrings or ring with this stone will look good even with office clothes and a strict business suit. Avoid the combination of gold and silver jewelry with turquoise inserts. 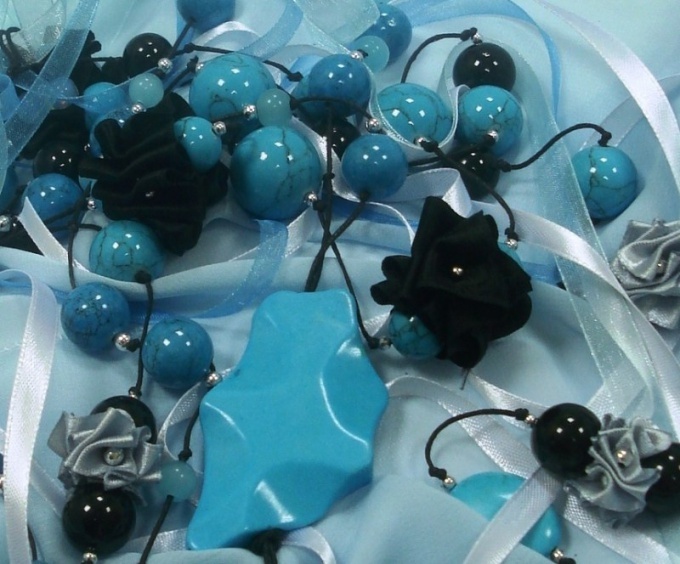 Also do not mix in one set of jewelry with "old" turquoise green shades of sky-blue stones. Don't forget that large stones in the large rings or earrings are suitable only for Mature women. Young girls should wear the necklace of light blue turquoise, small rings with a combination of stones, including turquoise, or the original bracelets. Wear turquoise not only as decoration but also as a talisman, which, according to ancient beliefs, and the opinion of the astrologers, is able to attract love, luck, health and prosperity. Wear a gold ring with a turquoise. Stone therapeutists consider that women is a decoration of great benefit, improving not only physical health but also emotional. Gold ring with blue stone will help a woman to relax, to tune to a positive perception of the surrounding things and the world in General, making it more spiritual and calm. Wearing the bracelet (Golden!) with turquoise on the right hand significantly strengthens the body and makes up for the lack of immune reserves after an illness. If you are often overwhelmed by such ailments as rheumatism, sore throat, allergies, diabetes, flu, skin inflammation, mental disorders, try to keep the stone in the decoration in contact with the body. Ideally, wear it, and thus constantly. Ensure that the jewelry made of turquoise is not lying a long time in the sun and don't wear them on the beach. Turquoise can change color, vihorev in the sun. Similar to the color of the stone is influenced by detergents and cosmetics. Turquoise is sometimes called the "stone of happiness". This semi-precious stone, used to make all sorts of decorative products. If we talk about the chemical composition, the turquoise is a hydrated phosphate of aluminium and copper. As with any compound containing copper, this mineral has a pronounced greenish-bluish color. Consider a few pieces of turquoise. This can be done, for example, the exhibition of stones and stone products. You will see that the color of turquoise can be quite different. Some pebbles blue with a slight greenish tinge, others painted in an intense blue-green color. All intermediate colors can be attributed to turquoise. But in practice, so-called mainly shades of blue with a tinge of green. Take a sheet of paper. Moisten it with water. Large surfaces are best wetted with a sponge. Will suit a wide soft brush. Let the water to dry up a little. Take the brush a small amount of blue paint, make the blot sheet, then evenly spread it across the surface. Make another blot, but the emerald green paint and smear it again. You have a color called turquoise. This color can be obtained in another way. Cover the part of the paper with blue paint, the other was green. Spots must be contiguous. Watercolor will flow and you will get different shades of turquoise, bluish with a slight admixture of green to green with blue tint. Gouache, unlike watercolors, do not mix directly on the sheet. To get a turquoise color, you will need a small Cup. Put a bit of blue paint, then the same green and mix thoroughly. If you need a lighter shade of turquoise blue, add white. Paints can be mixed in different proportions, depending on what exactly shade you need. To get the turquoise color pastels, on velvet paper, swipe a few strokes of blue crayon. Grind them to get the spot. RUB a piece of paper or an eraser. Add a couple of green strokes and also mash. The resulting color corresponds to that which in life is called turquoise. Find the turquoise color you can and in the palette offered in the program Adobe Photoshop. Its shades are in the part of the palette, where are the transitional colors from green to blue. To cover some part of the image of this paint, enough to take the dropper that is in the menu "Tools", you need a color to highlight part of the image that you are going to paint, and pour it with a watering can, you will also find in the menu "Tools" under the appropriate picture.